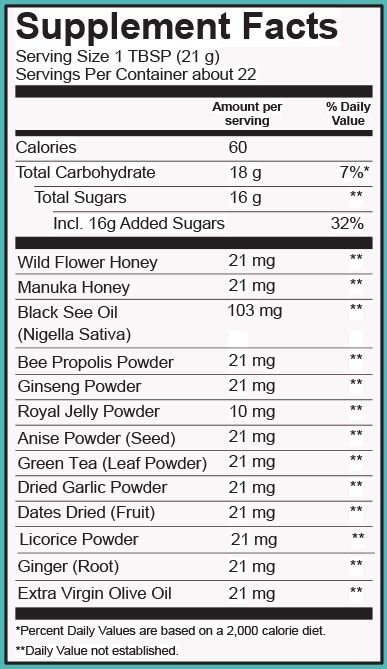 Black Seed Honey Nutritional Booster 16 oz. In this unique, vitalizing herbal tonic, we have synergistically infused some of the best natural blends of honey and herbs.The BOOSTER HONEY is a deliciously creamy healthy tonic. Can be mixed in any hot or cold beverage. Take one or two teaspoons daily. You may also add 2 teaspoons to hot water for a healthy herbal tea, naturally sweet. **DISCLAIMER** Thickening, seperation, or crystallization occur. Simply immerse whole jar in pan of boiled water for 10 minutes to restore consistency. Stir and enjoy! This product is manufactured in a facility that manufacture PEANUTS, TREE NUTS, MILK, EGG, AND WHEAT PRODUCTS. His Honey Natural Herbal Enhancement For Men 16 oz. Thsi is the best booster honey ever. It's useful for use before the seasons change. It helps fight off colds and it makes their immune system stronger. This works amazing on children and adults with a weak immune system. This is a wonderful product, especially good for children during the cold and flu season. I like to give it to my kids every morning to keep them healthy. And if I see signs of them coming down with something, I give them an extra dose and they are usually fine after that. My husband, mother-in-law and I use it too. I think it really does improve immune system function. I truly have seen results! I bought this product for my son who constantly had a runny nose, regardless of the season. After I began giving it to him every morning, sometimes 2xday, his condition improved dramatically & fairly quickly. It helped to strenghten his immune system in general. I am very happy with this product and now all our family consumes it. For adults it is great mixing it with a black seed oil for extra benefit. I get this for my mom as she has to take a treatment every 6 weeks that would break down her immune system to the point she would end up with pneumonia after every treatment. Since she started taking this every morning she has not once gotten pneumonia. It is a great product. I just tried the Booster for the first time, and I must say that this tastes just as great as the Original Black Seed & Honey. If you like the Original Black Seed & Honey, I'm pretty sure you're going to love the Booster, because the Booster has that same great, wonderfully mixed taste and benefits. I start my day with the Booster, and it gives me a lot of energy to make it through the day. Right before I go to bed, I add the Booster to my tea, and it leaves me relaxed, and I have an enjoyable rest. Whether day or night, I'm sure you'll love the Booster too. I'm definitely going to reorder this!